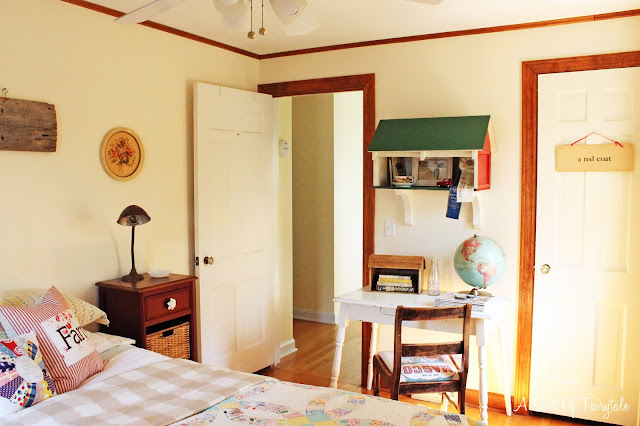 I don't remember when I started the makeover on this room from nursery to guestroom...maybe early spring??? Well, anyway, I have just about finished it up! The entire room was repainted, except the wood work. You can't see it in the above picture, but the wall her crib is on was painted blue. Maggie has since moved into the smallest of the 3 bedrooms we have. 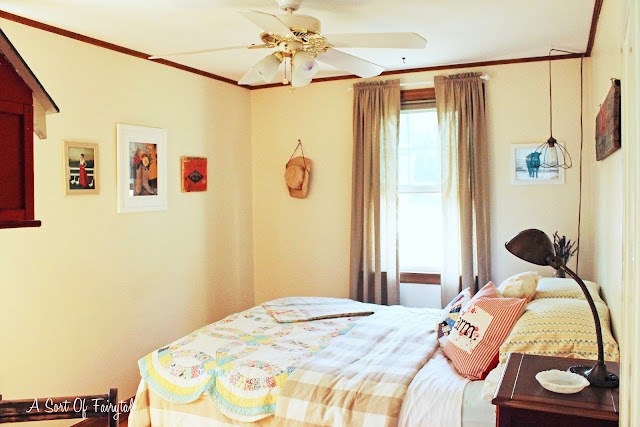 I wanted a proper guestroom for when my Mom visits, which is fairly often (a good thing). I am under no delusions that when Maggie is older, she will probably want this room back (sorry, Mom). they are $28 for and 18 x 18 cover and down insert. The bed is awaiting a vintage style iron headboard and maybe footboard. I'm still on the search for one at the right price! Maybe I should call this "The Traci Room"! I live in IL and found the prize ribbons at antique mall in Michigan...I love them! 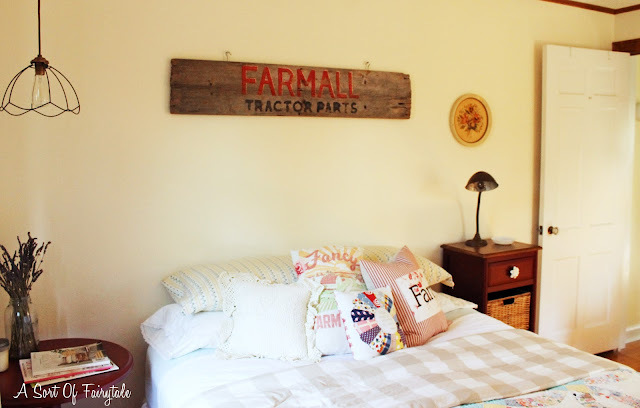 There ya have it...my farmhouse bedroom in my otherwise cottage style home! Oh, and I plan on getting you some pics this week for the project we talked about. Busy, busy around here! just adorable Stacy!! I passed up three, yes three, dollhouses at a rummage sale....and then got home and wished I'd bought them for shelving!! :( So sad I missed out. The room is coming together beautifully! I just love your barn collection! I am on the hunt for some but no luck so far. Plus I doubt I will find any at that price! I am sure your guest won't want to leave once planting themselves in the farm room. It looks adorable! Everything is so cute and cozy! That is SO charming Stacey! 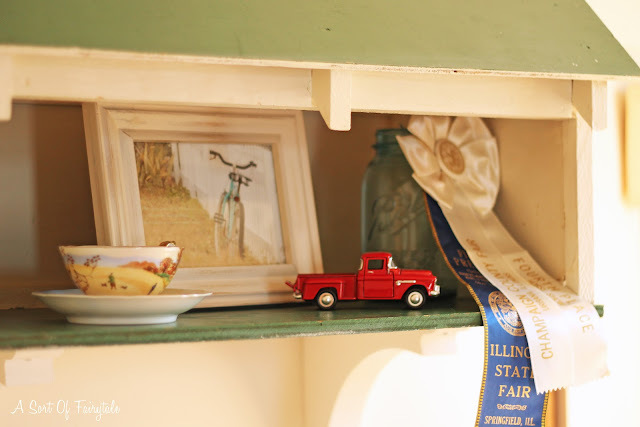 I love all the details the best, the light, the barn shelf, the ribbons, the wood sign, it's all so very swoon worthy. Love the makeover! Of course the barns are my favorite. 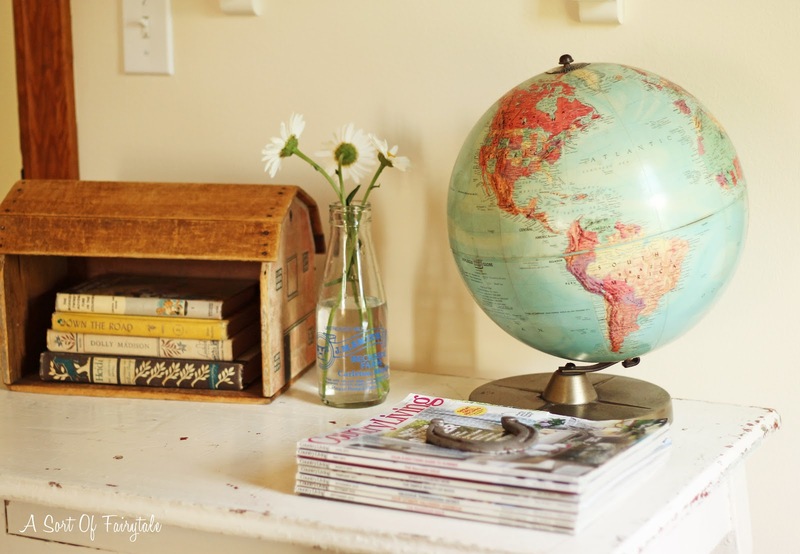 I've got several and one of them will be the star of my farmhouse bedroom if it ever gets finished! And the ceiling fan dilemma is a tough one. We don't have central air, so I know what you mean, they really do cool off a room. Your pillows are so cute! And the photography and curtains all say farmhouse to me! Your mother will love being a guest in that cozy room. The milk bottle vase, barn as a shelf and the wedding ring quilt on the bed are my favs! Great job! Doing something we love and having it turn out great is a wonderful thing, isn't it? Stacey So so cute!!!! I love the toy barn for a shelf. An idea for the ceiling fan to save $$ is to just spray paint it with Rustolum and you will get rid of the gold and still have a farm house look. Works great and saves. I look forward to your visit today. See you soon. looks great! 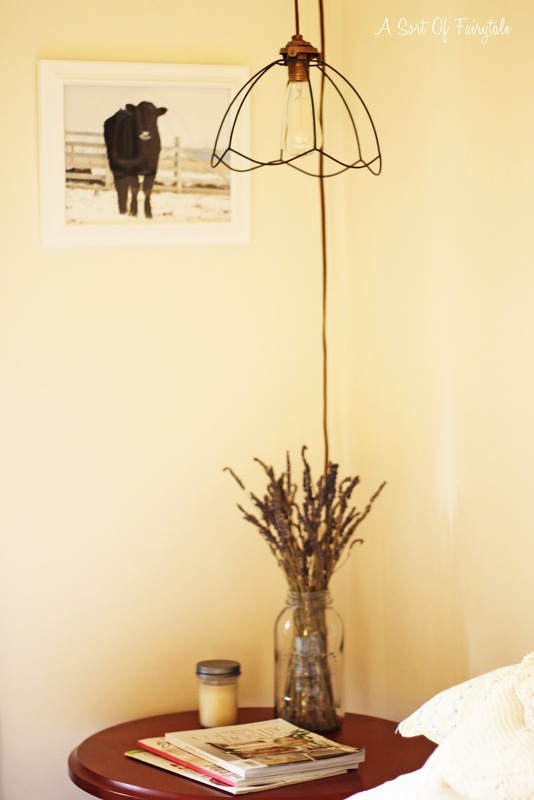 especially love the recovered chair & hanging lamp! I love it!!! 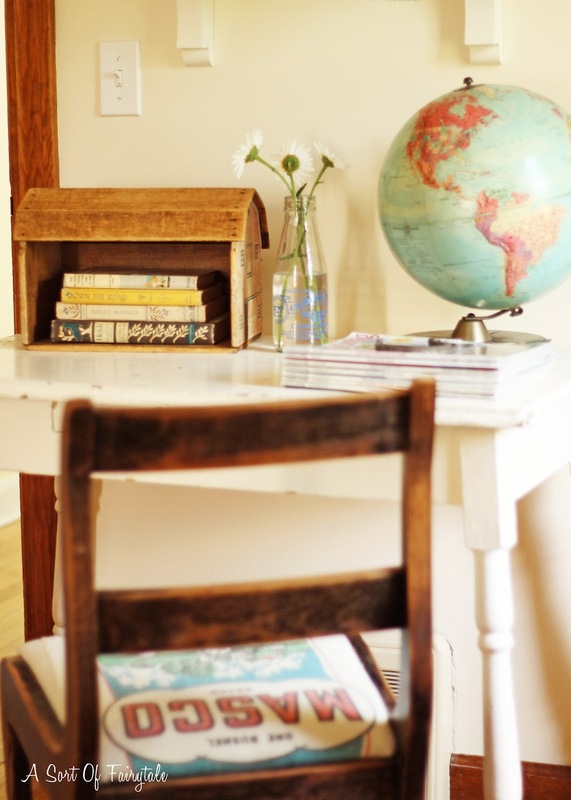 It's cozy, rustic and comfy...perfect retreat for your mom! Great job on the pillow and refinishing the chair. 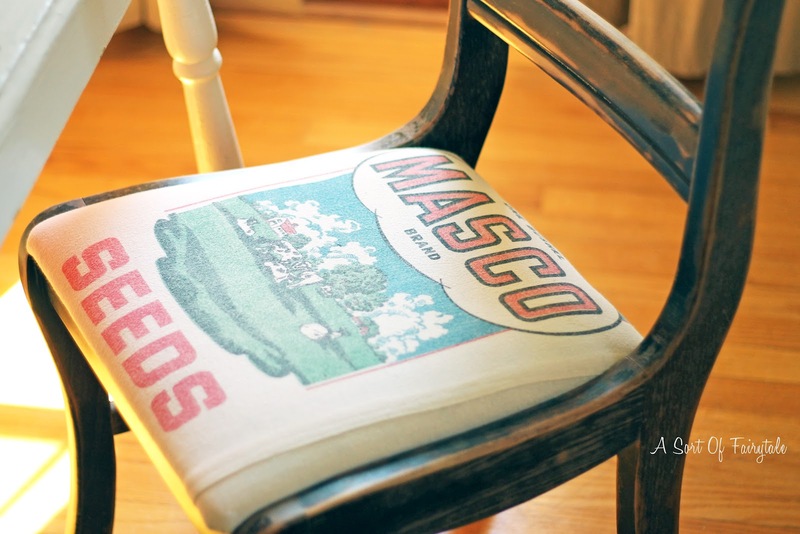 What a cute idea to use what looks like was once a grain sack for the seat cover. You have an excellent sense of style! 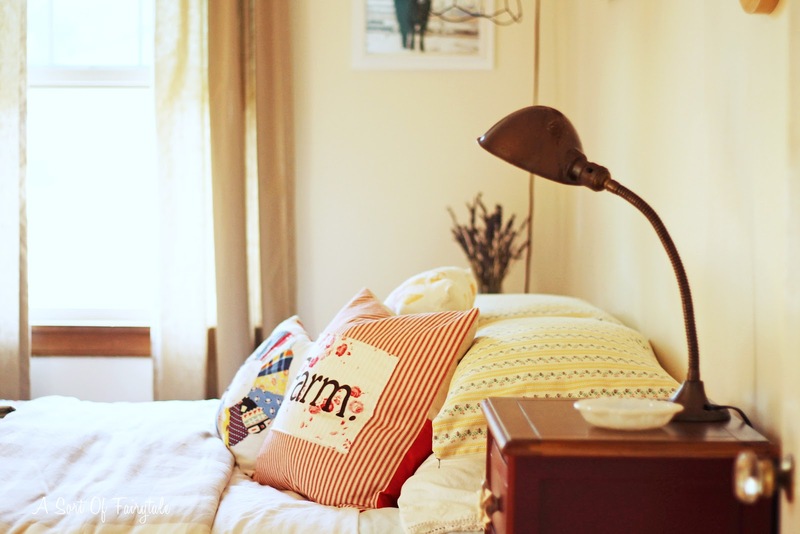 What a charming and cozy room...it's beautiful!! I might just have to kick your mama out and move in myself! sorry mom! ha! completely lovely, farmhouse fresh and so very calmly inviting! well done! i think you nailed it, stacey. the room looks like it evolved and is not 'decorated' which you know i love! Your Farm Style redo is just awesome. I can't wait to see it with the new bed, when you find it. The toy barns are such clever use here. Loving how you reupholstered that chair, too. Is that an after market fabric, or is it an actual vintage bag? So many wonderful details! Great job! I adore the little toy barns as shelves. Great idea. 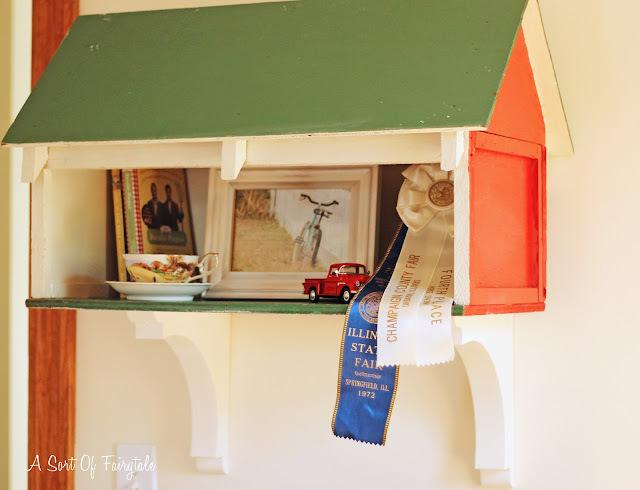 LOVE the toy barn shelf! So clever! What a great room, I'm sure your Mom will really enjoy staying there. i love the toy barn shelf!! looks lovely! Oh my goodness, Stacey, I love your farmhouse bedroom! It's the perfect combination of warm colors and vintage items. I love all the little details. Beautiful and so inviting! So...adorable!! You know how I love your fun style. You inspire me to want to decorate with lots of color. I am just a chicken, but I love admiring your home. pulse quickening at each angle! beautiful, stacey. just love it! I love it all! Especially the barn as a shelf. What a cute idea! 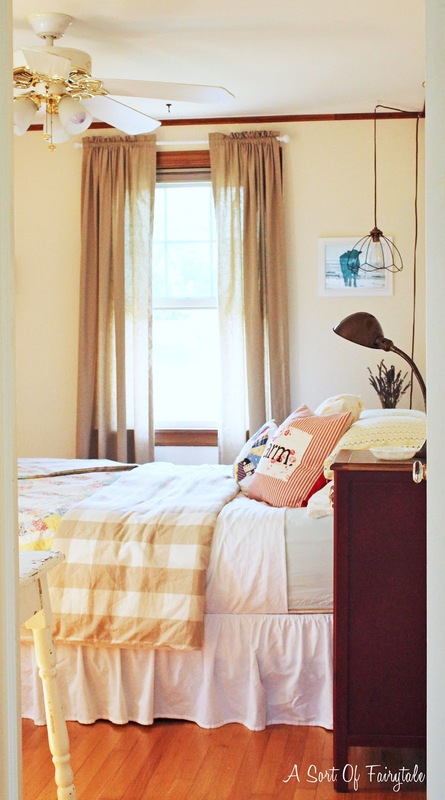 Your room turned out adorable. Love the pictures by Traci. Hey, that reminds me, we're still waiting for that photography class by her! Lol. See you soon! Love, love, love it. 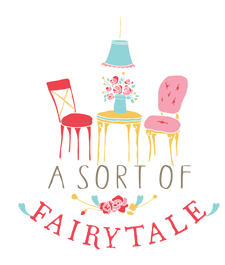 Just discovered your blog and am enjoying it so much! 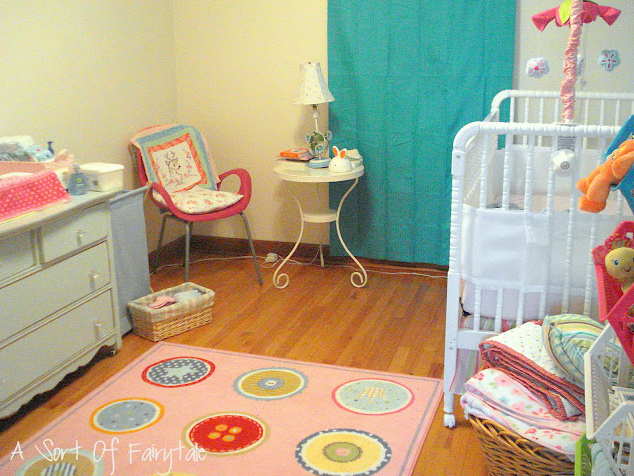 That room is so darn cute and sweet! I have never seen a wooden barn like that one on the desk. WHAT A FIND! We need to meet up again in september for French toast again! It's very vintage cute, Stacey! 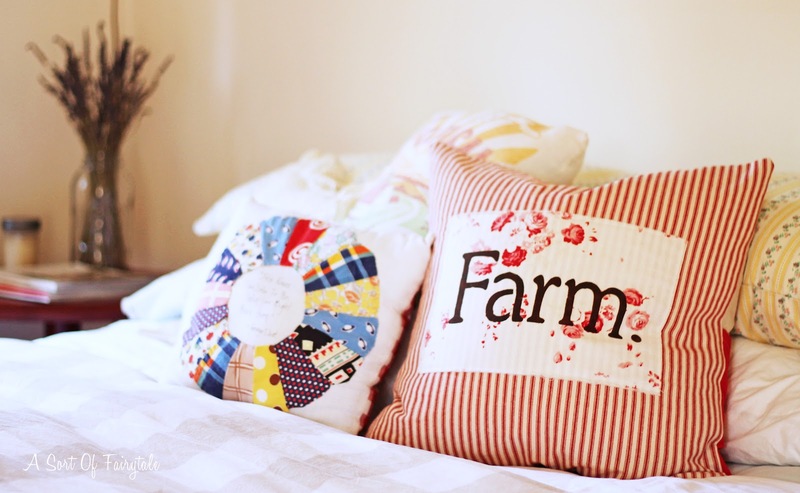 I love your farmhouse room. You've done a lovely job it looks so pretty, relaxing and comfy! You are so very talented. p.s. love the toy barn used as a shelf - genius!!!! I've only recently found your blog. I don't know if I had the whole tour...am going to check that out. But for now, I love this farmhouse room. There is such warmth in here. Dreamy. this is just a suggestion. Seeing how the ceiling fan is essential to air circulation and comfort...why not spray paint the brassy parts with something to match your desk lamp (I have my Grand-Dad's) and the hanging swag, wire cage lamp... You may even be able to change out the blade to match the wood trim in the room. It could be done inexpensively. Just a thought you might consider. I live in Texas and know what it's like to 'deal' with ceiling fans when you'd rather have something more decorative. Guurrrlll, you know I'm dying over this room, right?!? 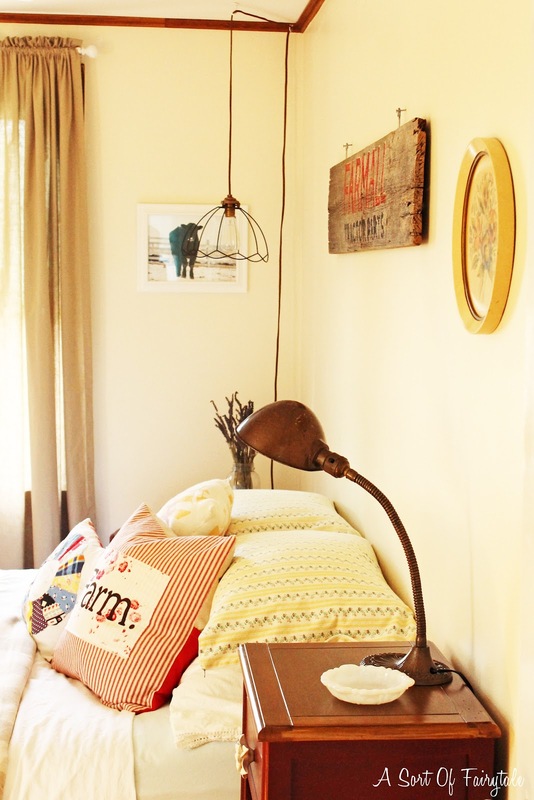 It's simultaneously airy and cozily warm, and all the vintage details...love the accessories you used! I've already looked over the photos several times, but with each new look, I see something else I like. Well done!